Hand-turned on a lathe, this striking container is crafted of solid alabaster*, a semi-percious stone valued for its magnificent beauty, high quality and delicate veining patterns. 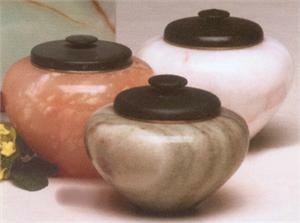 Lids are also hand-turned in black wonderstone and threaded with solid bronze fittings. Available in olive, orange or neutral. When ordering, please make color choice prior to adding this item to cart. *Due to the nature of stone, pattern and color will vary. 3.25" Dia. x 3"H; 11 cu. in.